We found a fun LEGO DUPLO Building Set deal on Amazon! Hurry and get the LEGO DUPLO My First Puzzle Pets Building Blocks (18 Piece) today for only (** CHECK CURRENT PRICE **) from Amazon! Check out all of the recent Amazon deals here! Shipping is delayed currently but you can order now and when it comes in stock, you will get FREE shipping (2-day for Amazon Prime members) when you purchase $25 or more of eligible items across any product category. Help your child build 3 colorful 3D LEGO DUPLO 10858 Puzzle Pets. Preschoolers will love sorting the chunky bricks into different colors, and seeing what animals they can build in each color. 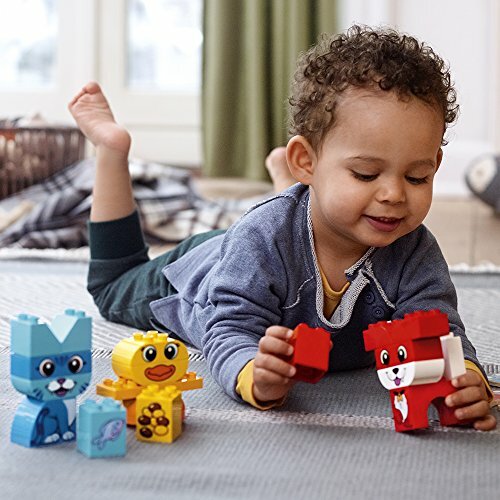 This puzzle toy for toddlers includes decorated bricks to start stories and develop language as young children learn what different pets like to eat. DUPLO bricks are specially designed to be fun and safe for small hands. Buy the LEGO DUPLO My First Puzzle Pets 10858 Building Blocks (18 Piece) from Amazon. Previous articleReal Cooking Ultimate Baking Starter Set (37 Pc. Kit) DEAL!